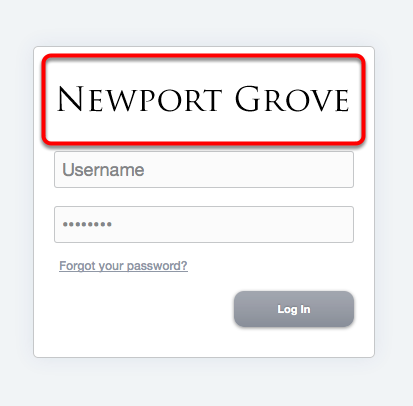 The login screen logo will be displayed when entering credentials to login to the Admin, Affiliate and Buyer Portals. Size: Width 299px x Any Height. The system logo is visible in the top left corner of the portals. : Width 41px x 41px. Note: The small logo size is required as it is also used for the page loading image. However, we advise including at least one of the large or medium logos. Note: If you wish to use only a ribbon/banner logo that contains your company logo instead of a system logo, then we advise uploading a transparent medium/large logo and utilizing this as the system logo so that only the ribbon/banner logo is visible in the UI. The system logo will lay overtop of the ribbon/banner and if no system logo is present then a hyperlink with the organization name will be utilized in its place. Uploading a transparent system logo instead will allow for a cleaner appearance. The favicon logo is visible in the navigation tab of your browser as well as in the bookmarks entry. The Ribbon/Banner Logo is completely optional. This logo will run along the top of the UI as indicated in the image above. It is important to note that the System Logo will overlay this ribbon logo. For example, if you wish to have a ribbon that contains a color or pattern then then system logo will be overlaid and display on top of the ribbon logo. Please do not include your logo on the ribbon as it will be overlaid with one of the System logos listed above. If you wish to use only a ribbon/banner logo and not a system logo then we advise uploading a transparent medium/large logo and utilizing this as the system logo so that only the ribbon/banner logo is visible in the UI.